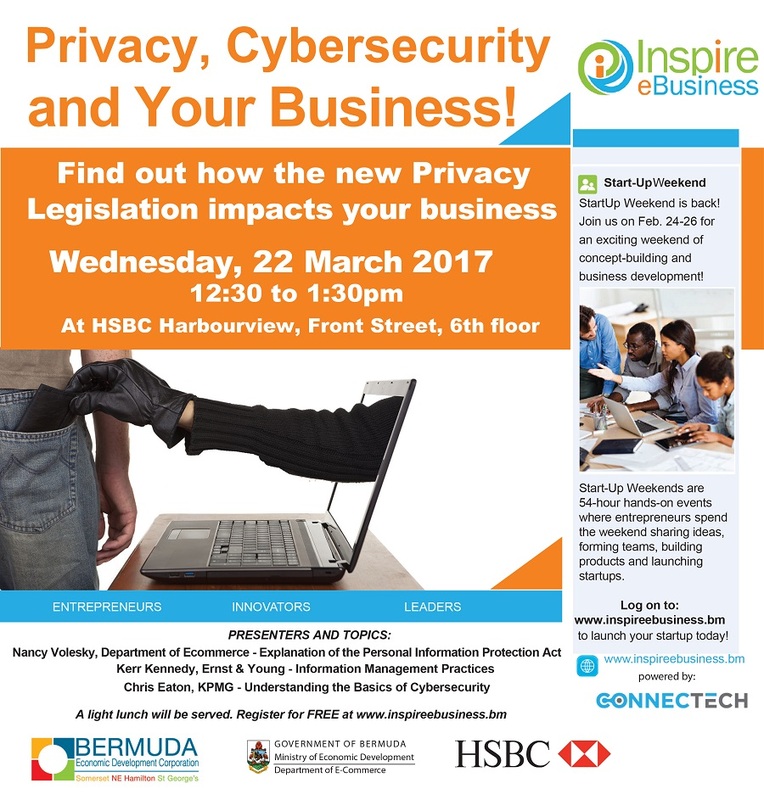 Inspire eBusiness will be hosting their sixth and last free seminar in the 2016/17 series — entitled “Privacy, Cybersecurity and Your Business” — on March 22 at 2.30pm at HSBC Harbourview Front Street. A spokesperson said, “Inspire eBusiness has held a series of free seminars for existing and new entrepreneurs interested in starting and managing online businesses. “The six seminar series started in September 2016 and included information on starting an online business, local rules & regulations governing online business, finding financing, and scaling and growing your business overseas. All previous seminars were held at the Chamber of Commerce. “In addition to the seminars listed, an 8 week hands-on workshop was also held in conjunction with Global Entrepreneurship Week in November, which helped attendees understand what was required to create a Facebook Page for business and the basics of creating a Shopify website. “The sixth and last seminar in the series, Privacy, Cybersecurity and Your Business will be held at HSBC Harbourview Front Street on the 6th floor on March 22nd, 2017 at 12:30 pm. “At this upcoming final seminar, Nancy Volesky of the Department of ICT Policy and Innovation [formerly the Department of E-Commerce] will provide attendees with information about the new Personal Information Protection Act [PIPA] which requires businesses to protect personal information such as customer information that is in their care. “In addition, Kerr Kennedy of Ernst & Young and Chris Eaton of KPMG will provide insight on best practices when managing information and demystifying Cybersecurity. “Those interested in attending the free seminar can log on to here to register. We encourage all small and medium sized businesses to register as PIPA impacts all business owners, online and brick & mortar alike. 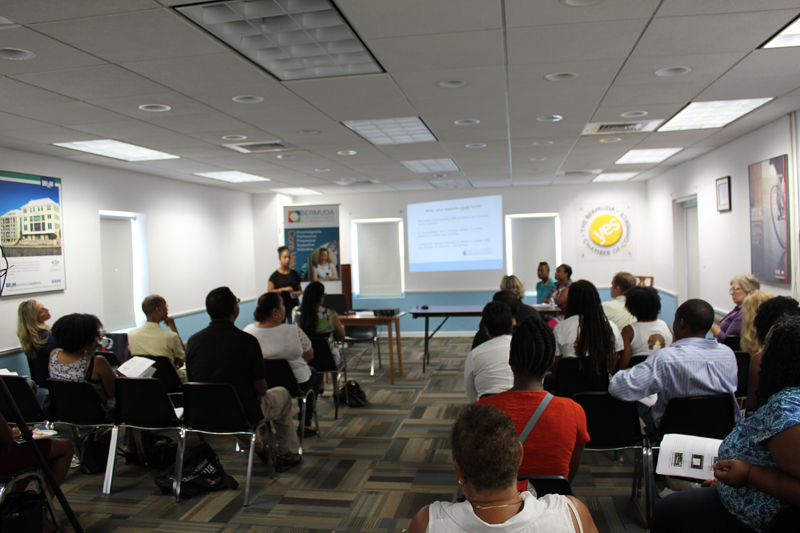 “Inspire eBusiness was launched in February 2014 with the objective of supporting and encouraging the development of local e-commerce business in Bermuda with a focus on educating existing and potential entrepreneurs as well as the public about the process of starting an online business and setting up ecommerce on their websites. “Inspire eBusiness is sponsored by the Department of E-Commerce within the Ministry of Economic Development. The initiative is coordinated by the Bermuda Economic Development Corporation with support from the Bermuda Chamber of Commerce–Business Technology Division.